Our service is of the highest quality offering both efficiency and reliability with an impressive turnaround. We are able to create high quality CAD designs to suit your needs. Customer service is very important to us and we always strive to do our best for every client. Our service is of the highest quality offering both efficiency and reliability with an impressive turnaround. 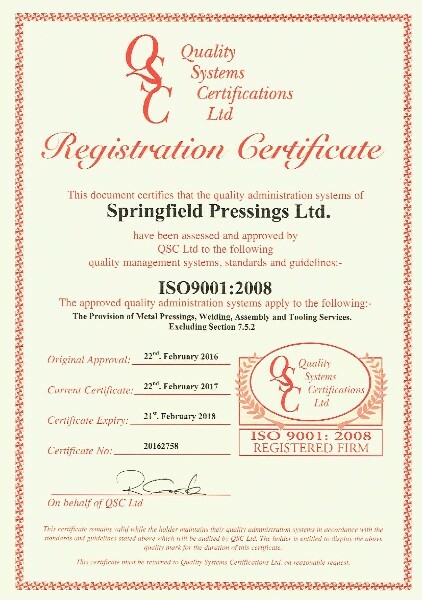 At Springfield Pressings we ensure we stick to our clients budgets and deadlines and aim to not only meet our client's expectations but exceed them by always ensuring the continuity of quality with excellent lead times. Due to our excellent communication, great customer service skills, and manufacturing expertise, Springfield Pressings have built an outstanding reputation within the engineering industry, and we are proud to say we have many satisfied clients within various industry sectors including the Aerospace, marine, medical, and architectural industries. So for all of your precision toolmaking, pressed metal work, metal fabrication requirements or for further information please feel free to contact us on 0116 2769953 an experienced member of staff will be very happy to help you with your enquiries. Established for over 70 years in Leicester, Springfield Pressings has specialised in metal pressing & press tool making. As an ISO 9001:2008 certified company, you can count on quality parts delivered on time at competitive prices. We combine our vast knowledge of design and manufacture with the most up to date technology of presswork, toolmaking and fabrication to BS 1090. Springfield Pressings also supply metal fabrication, point of sale metalwork & metal assemblies to a varied market including Aerospace, marine, medical, architectural, electronics, brewery, vintage automotive, food & leisure industries. We provide our customers with a "one-stop solution" for precision engineered metal products and have a wealth of experience which enables us to supply our customers with professional quality presswork and precision toolmaking solutions. Good service, good quality, reasonable prices & a local company. Easy to get along with and always ready to help out when required. Also good communication skills. Willing to go the extra mile, Springfield Pressings finds answers to problems in a simple & professional way. Needless to say you will be receiving many enquiries from us in the near future. After a long established partnership we continue to buy from Springfield Pressings, with tooling already in place for our wide range of items. Very friendly and willing to help. Good quality.